This month I began my internship at the Truman Institute in addition to my studies in university. The institute was the first institute in the Middle East dedicated to the advancement of peace in the region. My role in the institute is as a research assistant to Dr. Michael Tanchum, where I am writing reports on many topics – currently I am researching Iran’s economic and political influence in Iraq, and how this affects the region. The work is very intense, but I am able to use my knowledge of Arabic to help with the research and so I’m able to develop my language skills while also working. 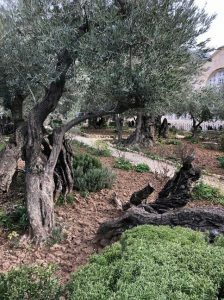 Despite my busy schedule, I was able to visit the Garden of Gethsemane, located just outside the old city walls in East Jerusalem. 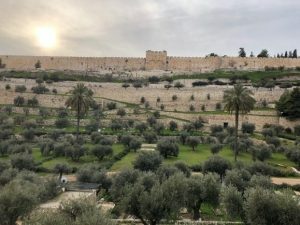 The name “Gethsemane” comes from the Hebrew for “Oil Press”, and today there are still many olive trees in the garden. Researches from Italy have found that the trees in the garden date from the Middle Ages, making them some of the oldest examples of Olive Tree in the world. 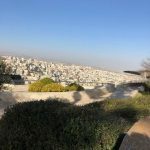 Famously this was the place where Jesus was betrayed by Judas before his crucifixion and it is still an important Christian site today; when I was there, there were a number of American and Russian tourists who came to visit the famous site for religious reasons. Now to finish, the weather in Jerusalem is terrible, when I came to the Middle East I expected the weather to be hot and pleasant, but instead it’s cold, windy and miserable. Living on Mount Scopus, the situation is worse, so my next big mission is to buy a new coat for this weather! الشهر هاد، بلشت التدريب تاعي في معهد “ترومان” بالإضافة لدراستي بالجامعة. المعهد كان المعهد الأول بالشرق الأوسط المخصص بالنهوض بالسلام في المنطقة. دوري بالمعهد مساعد البحث مع دكتور “مايكال تنحوم”، انا بكتب تقارير عن كتير مواضيع، عم ببحث النفوذ الاقتصادي والسياسي لإيران في العراق، وكيف هاد بأثّر ع المنطقة. الشغل كتير مكثف، بس بقدر استعمل معلوماتي العربية عشان اساعد في البحث، فبقدر اطور قدراتي اللغوية بنفس وقت الشغل. رغم جدولي المشغول، قدرت أزور جثسيماني، بقع برا حوائط وسط البلد في شرق القدس. الاسم “جثسيماني” عبري لـ”عصارة زيوت”، ولليوم في كتير أشجار زيتون في الحديقة. باحثين من إيطاليا كشفوا أن الأشجار بالجنينة من العصور الوسطى، يعني أنهم بعض من أقدم شجر الزيتون بالعالم. معروف انو هاد هو المكان الي يسوع انخان فيه من يهوذا قبل صلبه وهو لسا موقع مسيحي مهم لحد اليوم. لما كنت هناك، كان في كتير سياح أمريكين وروسين اجوا عشان يزوروا الموقع لأسباب دينية. هلأ، لننهي، الجو بالقدس فظيع، لما جيت عالشرق الأوشط، توقعت إنو الجو يكون حر ولطيف، بس هلا برد وعواصف كتير. أنا ساكن بجبل المشارف، الوضع أسوء، فمهمتي الكبيرة الجاية هي اني اشتري كبود جديد للجو هاد!